Is it possible to mix and match objectives lenses from one brand of microscope to another? It depends on your type of microscope, but sometimes yes, it is possible. The objective lenses you use on your microscope need to be the same tube length as the microscope. For example, if your microscope has a 160mm fixed tube length you will need to use 160mm tube length objective lenses. Many older or inexpensive microscopes, when measuring from the back end of the microscope to the primary focal plane are limited to 160mm, therefore they have a 160mm fixed tube length. More advanced microscopes use a series of lenses and prisms to allow for an "infinite" distance between the back end of the microscope to the primary focal plane. These microscopes have an "Infinity Corrected" optical system and will use Infinity Corrected objective lenses. 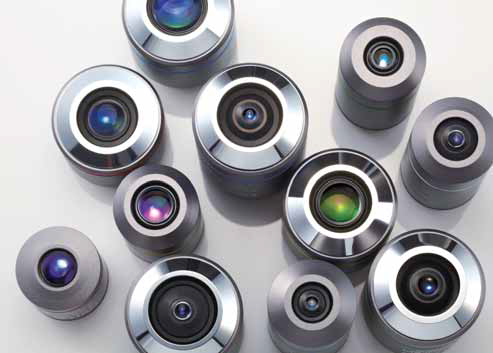 A few things to keep in mind if you do choose to mix and match microscope objective lenses from one microscope brand to another. Digital microscopy images may not match up when mixing objective lenses from one brand to another, even if you make sure the microscope tube length and the objective are comparable. You may be able to simply refocus the microscopy image for the camera. If you are using mixed objective lenses on the microscope turret, they most likely will not be parfocalled (each objective in focus when switching from one magnification to another). You can still use the objectives, just be prepared to allow a bit more time for re-focusing when changing magnifications. Before you purchase another objective lens, make sure the lens uses the same thread size or be prepared to use a threaded adapter. If you are using specialty microscopy techniques such as phase contrast or darkfield microscopy mixing objective lenses might not work well.